The strange phenomenon that's destroying Latin America. 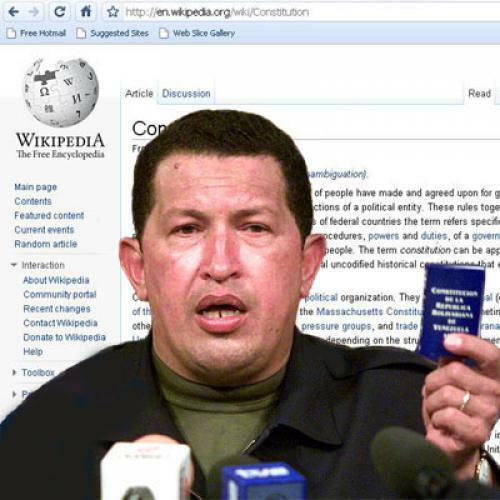 Last year, Hugo Chavez amended Venezuela's constitution and abolished term limits. The entire business was a bit odd, but not because the constitution was changed, which is quite common in Latin America. Nor was it because the changes involved extended his rule (which is equally common). No, what was unusual about the constitutional reform of 2009 was that abolishing term-limits was all it did. You see, constitutions are uniquely plastic in Latin America. Not only are presidents exceptionally powerful here—I live in Caracas, and it is not at all uncommon to turn on the television to find El Comandante on every TV channel, explaining currency valuations or riot control measures or energy crises or international weather phenomena as if he himself was the entirety of the government and all of its ministries—but, in addition, Latin American leaders have a nasty habit of rewriting their countries' constitutions more than anywhere else in the world. Many of these rewrites go beyond term limits, however. Chavez’s constitution of 1999 disbanded the upper house of the legislature, rearranged the lower house, separated authority among five "powers" (including citizens and electoral councils, as well as the usual legislature, executive, and judiciary), and redesigned and renamed nearly all government ministries. The result was the same thing that nearly always emerges from such restructurings: a significantly strengthened executive in direct control of oil revenues, judicial appointments, and an increasingly rubber-stamp National Assembly. It was the institution of the presidency that emerged intact, recognizable, and all the stronger from the restructuring process—meanwhile the other institutions had to start at square one, lacking the institutional legitimacy, memory, relationships, and mandate necessary to govern independently. This type of dictatorial redesign is a grand tradition among the region's caudillos, the iconic strongmen, dating all the way back to the liberator of South America, Simon Bolivar. And yet, despite their authoritarian intentions, modern-day caudillos approach the process of constitutional revision with a certain delicacy. Constitutions rarely include provisions for their own destruction, so replacing them in the absence of a massive social upheaval can be tricky. There was a time when the Trujillos, Gómezes, and Somozas of this world could create constitutions through sheer force of personality, but, nowadays, leaders generally attempt to legitimize them through plebiscites. Using state funds, they launch massive media campaigns extolling how their new documents are “the best in the world” (Ecuador’s Rafael Correa) or that they will solve “all the [country's] problems” (Bolivia’s Evo Morales). Oddly, one effect of these campaigns has been the inflation of constitutional word counts. Latin American leaders have discovered that, by packaging ever-longer lists of promises and rights alongside greater executive functions, they can make a new constitution appealing enough to the masses that they will vote for it in a referendum. The result is constitutions that are not only the shortest-lived, but also among the longest in the world. Bolivia's and Ecuador’s recently approved constitutions have 411 and 444 articles, respectively, and read like laundry lists of guaranteed rights, such as access to mail and telephones; guarantees for culture, identity, and dignity; and shorter work-weeks. By contrast, the U.S. Constitution, the longest-serving in the world, has only seven articles and 27 amendments. The biggest question, though, is why the caudillos bother at all. Authoritarian leaders in Africa, Europe, and Asia have long been content to suspend their constitutions by declaring states of emergency, or just ignore them outright. Egypt's leaders, for example, have been governing under the "Emergency Law," which grants them dictatorial powers, extending the statute by three-year increments since 1967. By contrast, efforts to actually change a constitution expend large chunks of both political and financial capital. Worse yet, it’s risky: Only last summer, Manuel Zelaya of Honduras was overthrown by an alliance between his supreme court, army, and congress, while trying to pass a rewritten constitution through a plebiscite. Earlier in the decade, Peruvian strongman Alberto Fujimori changed his constitution successfully, but soon experienced a downfall so precipitous that he is now serving a 25-year prison term. Even Chavez himself failed to pass a proposed 2007 constitution and was left with a considerable amount of egg on his face. You'd think these leaders would learn from Fidel Castro, who wrote only one constitution and managed to stay around forever. One obvious explanation could be that, for countries in the American hegemon's proverbial backyard, the veneer of constitutional legitimacy may carry greater value than elsewhere. Perhaps, then, the risks and expenditures of Wiki-constitutionalism are worth it in order to consolidate power without risking foreign aid, market access, and regional peace. And yet, this answer is at best incomplete. Latin American constitutions were already flipping like pancakes during the first half of the nineteenth century, which predates the rise of North America to hemispheric dominance. What's more, plenty of countries including the United Kingdom, Israel, and Saudi Arabia have no problem maintaining close ties with the United States, despite having no formal constitutions at all. Indeed, even scholars who know the issue best have a difficult time providing a definitive answer. Ultimately, Wiki-constitutionalism is likely the result of a confluence of factors, from geography to constitutional traditions to Latin America's legacy of instability and even the region's culture. Half a millennium ago, when Spanish explorers first began dotting the coasts of a New World with their settlements, they were always particular in planning the layout of towns at the very moment of their founding. Maps would be drawn up meticulously, delineating the boundaries of a cathedral, a governor’s mansion, a central plaza, barracks, and all the future cornerstones of a bustling city. Yet the town itself might well be sparsely populated forever, and these edifices would, as likely as not, never be built. Whatever the cause, Wiki-constitutionalism has proven to be a quixotic and fruitless practice. Evo Morales and his supporters will someday find that the recently passed Bolivian constitution will not, in fact, solve “all the problems of Bolivia,” because no constitution ever could. And when the perfect country outlined by their constitution invariably fails to materialize, the impulse will be there to blame the design. There will be calls to change the system, and the precedent set by this constitution (and all the others) will make adopting yet another one feasible. Yet doing so will only extend a dynamic that has undermined stability in the region for generations. If Latin American institutions are ever to become strong enough that they can keep powerful, popular presidents from doing whatever they want, Wiki-constitutionalism must end. Daniel Lansberg-Rodriguez directs entrepreneurial development programs for the Sucre municipal government in Caracas, Venezuela. He is a graduate of Carleton College and the Harvard Kennedy School.